The secondary bond market yields remained mostly unchanged yesterday with activity witnessed on the 2021 maturities (i.e. 01.03.21, 01.05.21, 15.10.21 and 15.12.21), 15.03.23 and the two 2028 maturities (i.e. 15.03.28 and 01.09.28) at levels of 9.53% to 9.71%, 9.95% and 10.22% to 10.35% respectively. The total secondary market Treasury bond/bill transacted volumes for 29 August 2018 was Rs.7.50 billion. In the money market, overnight call money and repo rates increased further to average 7.87% and 7.97% respectively, as the Open Market Operations (OMO) Department of the Central Bank of Sri Lanka was seen draining out an amount of Rs.15.58 billion on an overnight basis at a weighted average of 7.95% by way of an overnight repo auction. The net surplus liquidity in the system increased further to Rs.28.24 billion. In the Forex market, the USD/LKR spot rate depreciated marginally yesterday to close the day at Rs.161.40/50 against its previous day’s closing levels of Rs.161.40/45 on the back of continued buying interest from banks. The total USD/LKR traded volume for 28 August 2018 was $ 64.85 million. 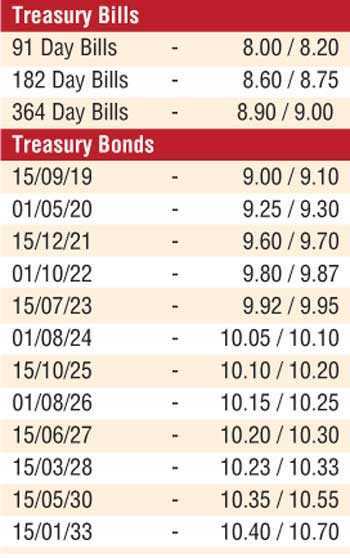 Some of the forward USD/LKR rates that prevailed in the market were 1 Month - 162.15/35; 3 Months - 163.70/00 and 6 Months - 166.15/45.